A book printed in 1677 (“Museo Cospiano annesso a quello del famoso Ulisse Aldrovandi”) comments on a number of different card games. At p. 304, Boiardo's tarot game is described. The author correctly notes that the game is at least 170 years old. Apparently, the fact the cards had been invented by Boaiardo was not known to the authors of the book. At p.305 a French “deck of moral cards” is described. Apparently, in this XVI century deck, the four suits correspond to four Latin poets: Horatius, Seneca, Plautus and Ovid. At p. 307: Tarot cards: used in Bologna 170 years ago and more, as proven by the backs of the cards, in which the device of the Bentivoglio is displayed, as they used at that time, when they had the authority of Princes, i.e. with a red saw, and nothing else on the shield, and a panther above the crest, with their motto “FIDES, ET AMOR” [faith and love]. These cards are much larger than the ordinary ones, and painted with many colors. This game requires more thought than luck, but the sacred figures, such as that of the Pope, do not fit well in it: they should not appear in a game. Even the unorthodox are scandalized by such an abuse. Also at p.307, the Mitelli tarocchino deck is described. The author writes that the deck was printed in Rome as a work by Annibale Carracci. Nice source. It seems to be a description of the inventory of a museum, likely this Museo Cospiano, made by Ferdinand Cospi. If this material still exists somewhere? A complete Boiardo deck? Somewhere hidden in an archive? Huck wrote: Nice source. It seems to be a description of the inventory of a museum, likely this Museo Cospiano, made by Ferdinand Copi. Yes, it was a baroque museum, apparently filled with different stuff. The museum was in Bologna and its owner (Ferdinando Cospi) donated it to the state. 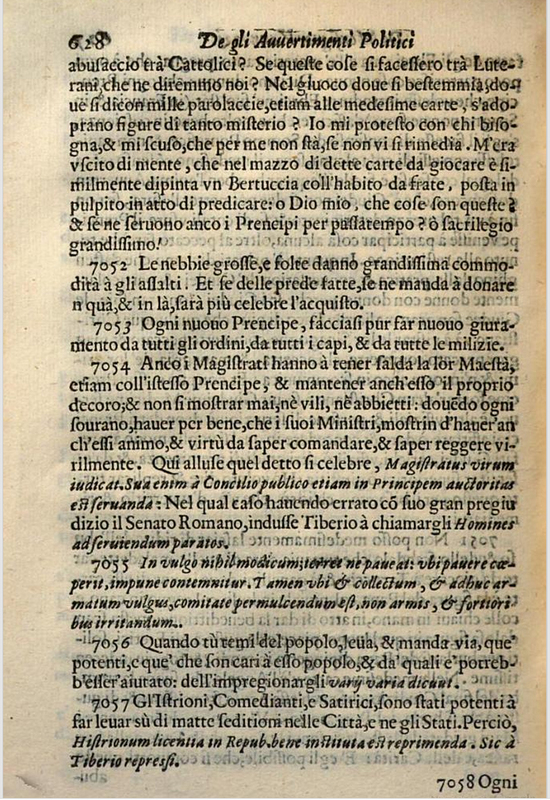 The book was written by one Lorenzo Legati from Cremona, "philosopher, physician and teacher of Greek letters in Bologna". Huck wrote: If this material still exists somewhere? A complete Boiardo deck? Somewhere hidden in an archive? At p.307, paragraph 12, Legati says that he believes that tarot was invented in Bologna: All the above mentioned games were derived from Tarot, which was invented, as they say, in Bologna, and practiced there more than in other places, when the Bentivoglio ruled as princes. The cards preserved here are a proof of this. Yes, but we don't know the trumps. Or do you mean, that the deck sold in London 1971 had been the same cards, same deck? I think, that the poem, not the deck, had been made for the wedding of Lucrezia d'Este, who married Annibalwe Bentivoglio ... and went to Bologna. So the existence of these cards in Bologna are not really surprising, though the decks likely were made after Boiardo's poem, perhaps after his death. Viti's commentary gave reason for this suspicion. Perhaps imitating a hand painted version? I don't know the Bentivoglio heraldic. Is this from Bentivoglio? marco wrote: At p.307, paragraph 12, Legati says that he believes that tarot was invented in Bologna: All the above mentioned games were derived from Tarot, which was invented, as they say, in Bologna, and practiced there more than in other places, when the Bentivoglio ruled as princes. The cards preserved here are a proof of this. Legati's book is probably contemporary with the Fibbia painting (with its legend of Tarocchino's invention), so it reconfirms that there was a current of belief in Bologna that they invented the game. The phrase "com' è fama", "as it is reputed" (as they say, etc. ), really proves it. It is also interesting that the belief about regular playing cards being derived from Tarot was already current in 1677. Quite a rich little text. Che sol salvarsi in un publico danno. Questo gioco ho composto e i' stesso il danno. Via manda, come corda d'archo un strale. Scusomi anch'io si da natura imparo. The poem card must have made another card "missing", an error in the descriptions, which already was seen by Dummett. It was almost sure (99.9% I would say), that these cards were the same which were known to Merlin (cause of similarities in the descriptions). The cards of Christie's were bought 1971 by a Carlo Alberto Chiesa in Milan. who generously supplied 29 photographs of the cards. 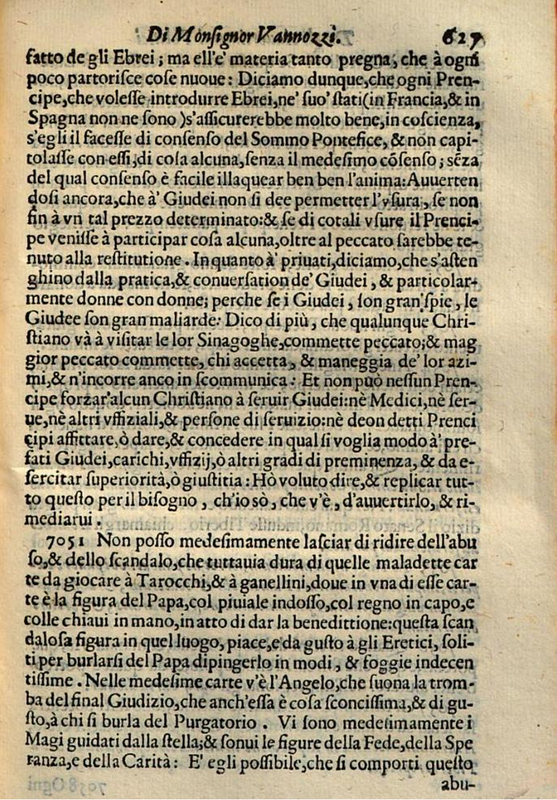 Dummett notes, that Carlo Lozzi, Le antiche Carte de Giuoco in La Bibliofilia, vol. 1, (Florence 1900) pp. 37-46 and 181-6 mentions un mazzo di giuco morale, de 1500, circa, detto delle passioni, which had 40 number cards (but no courts) and 21 trionfi (but no Fool). There's nothing about the Museo Cospiano in the text. Added later: Reading the Italian text of the inventory again, I get, that this text also speaks of 40 number cards and 21 trumps ... as for the deck, which was reported by Carlo Lozzi. So it's likely the same. Rereading this juicy little text of Lorenzo Legati, I noticed that he had a marginal note to "Vannoz. Avvetamen. Polit. e Moral. P. III. nn. 7057." I took a wild guess that "Vannoz." was either a Vannozzi or Vannozzo, and that "Avvetamen" was a misspelling for "Avvertamen." (-te or -ti). I soon found the probable reference in the title Della Supellettile degli Avvertimenti Politici, Morali et Christiani di Mons. Bonifatio Vannozzi, vol. III (Bologna, 1613), pp. 627-628, where the actual reference is to note 7051 (not 7057). It is quite a good one, referencing both Tarocchi and Ganellini (Minchiate), and condemning them for including the Pope and the Last Judgment, as well as the Three Theological Virtues (presumably referring to Minchiate here). I include the full pages for the sake of context (I haven't studied the work to know how it is arranged - it appears to be a fairly random collection of rants and other thoughts, used by consulting the extensive Tavola at the end of each volume), and its relevance to this thread. Note 7057 itself is an observation that actors might cause civil unrest, invoking a law of the Emperor Tiberius. I'm not sure what "sono stati potentì à far leuar sù di matte seditìoni" might mean - "wild/random sedition", or otherwise said, hooliganism? Vannozzi's biographical note at Archivio Pistoia doesn't note any time spent in Bologna, but as an important and troubled papal city, he must have spent some time there. He seems to have spent most of his time, when stationed in Italy, between Florence, Rome and Naples. Of course his concerns about the Pope and Judgment cards wouldn't be addressed until over a century later in 1725, when the authorities forced cardmakers to change the papi to mori, and tried to change the Angel (Last Judgment) to "a lady". The author writes 1677 and 1677 minus 133 years means the year 1544. 285. An extremely interesting and, to me, previously unknown pack with fanciful suitmarks (Cupids, Goats, Harps and Millstones) made in 1544 by Christian Wechel of Paris, whose name is recorded in d'Allemagne as a maître cartier. The main body of the cards was filled with quotations in Latin from the works of Ovid, Seneca, Horace and Plautus. Not surprisingly this exceptional item fetched a high price (320 gns.)" Can this be accidental .... ? Or have we to suspect, that the Wechel deck from 1677 (in Museo Cospiano) was the same as that from the auction in 1971? But the Boiardo deck from the auction was that, which was copied by Merlin, and it was not identical to the Museo Cospiano Boiardo deck, which seems to be that, which was observed by Carlo Lozzi. It's in your own post of Legati's text, the second post on this thread. Hint - "marginal note" means "note in the margin". Not so remarkable, but it is, what it is ... not so much GREAT ART, just a little (German) fun with playing cards.